​"The writing in these startling stories by Nate Liederbach is vivid and innovative and perfect for the wild and unexpected events. The scope ranges from the apocalyptically large to the intimately small, and all of it is interesting and moving. Chances are taken, and they pay off. Yes, there is a high jumping economist and witches and outlaws and a tongue to be shaved, but also a candy bar from the past and roadkill, and you get to take your daughter to heaven for a little vacation. I love finding rare writers who are telling the stories only they can tell. Settle in and be ready to be surprised by Blessings Galore. "Nate Liederbach deftly combines slipstream literary fiction and visionary dialogue to pioneer a futuristic territory saturated with intoxicating language. Eloquent, yet tight, Blessings Galore is a heady mixture of stunning story and thoughtful philosophy." "Blessings Galore bears the hallmarks of an experimental classic--it is at once lurid, zestfully grotesque, and utterly wondroous. Nate Liederbach punches not up or down in this wild collection, but straight at the reader's chest, where all the blood and muscle converges--in other words, these stories are not even remotely for the faint of heart." 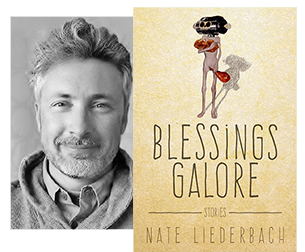 Nate Liederbach is the author of Doing a Bit of Bleeding, Negative Spacesand Beasts You'll Never See (winner of the 2014 Noemi Press Fiction Award). Among other honors, his writing has received the Academy of American Poets' Larry Levis Prize , the Atlantic Monthly College Nonfiction Prize, a Best New Poets inclusion, and the Utah Original Writing Competition's Short Fictin Award. Helives in Olympia, Washington.